Flea markets are trendy nowadays. We can see accessories that are made by artists, candles and even food when we go around flea markets. About a month ago, I visited a couple as a Gachonian staff member. The flea market was held inside a festival area. I saw amazing scenes while looking around the market tables. 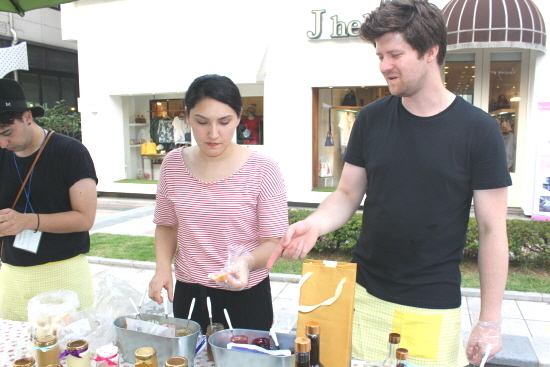 Foreign couples were selling jams that were made by them. It was an amazing scene to me. More surprisingly, they were trying to sell handmade jams to people using fluent Korean and humorous speaking skills. I became interested in that situation so I got close to their table and tasted cafe latté jam, pure rosemary jam, and other delicious jams. Then I bought one of their jams. I felt human affection from that couple who offered numerous taste samples to people, unlike other markets. I wanted to know more about this couple who meet customers with a happy smile. So, I asked them for an interview. 1. Please tell us how you decided to live in South Korea! About seven years ago, my husband and I came to Korea to study. In Germany, we finished our Korean studies and came to Korea with scholarships! At that time, we planned to go back to Germany after two years but we decided to live in Korea because unexpectedly, our jam business was successful. 2. Why did you decide to make jam and sell it? In Germany, people give eggs as presents on Easter day. So I made strawberry jam with basil and gave it to my Korean friend on Easter day. At that time, my friend told me that my strawberry jam was very delicious and advised me to sell it in the flea market. So I started selling jams in the flea market and sold out all of my jams! 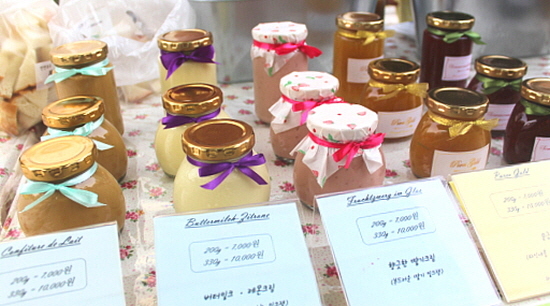 After that, I also started to selling jams at Myeongdong and City Hall flea markets. Moreover, we became popular so we had a chance to sell jams in an international handmade fair. From that fair, we sold 1,000 jars of jams in four days and I cannot forget that memory. 3. I think you make unique jams. Where do the ideas come from? We make different kinds of jams like, café latté jam, butter-milk jam, pure gold jam., grapefruit marmalade jam, etc. We sometimes make our own flavored jams. For instance, we made café latté jam. However, our business name is Omas Marmeladen, which means grandmother’s jam, and most of our jam recipes follow traditional family recipes that we learned from our grandmothers. Like Kimjang (making kimchi) culture in Korea, there is a jam culture in Germany! This is why we have unique and delicious jams. For example, German people traditionally eat jams that contain berries, but there are also wine-berry jams in Germany. People put not only berries but also a bottle of red wine in there jam when making it. We reflect German culture when we cook our jams. 4. Is there any way to enjoy eating jam except eating it with bread? First, you can put jams on waffles and cakes. It is also delicious to put jam on yogurt. People in Germany add pineapple jam when cooking curry to adjust the sugar level. 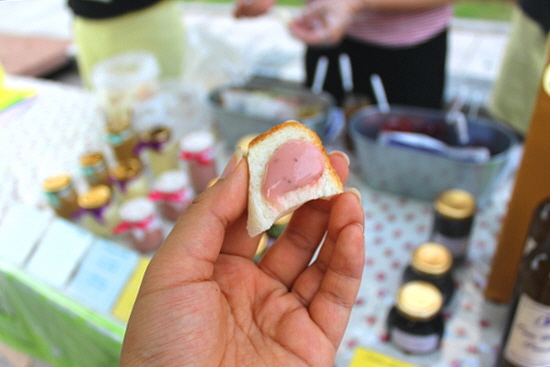 Lastly, it is great to eat jam with cheese and meat and other fatty animal food products. 5. What are some advantages and disadvantages of working with your husband or wife? Indeed, there is no disadvantage to working together except that there may be a difference of opinion when making a new jam. We both love food so we think we are so lucky to cook jam together and sell them. Therefore, we like every moment that we spend together. It is like going on a date. 6. I guess you use only Instagram to advertise your brand! It seems not enough but how is your business going so well? Actually we did not even use Instagram. We started using Instagram as an advertising tool after we got advice from a friend. Umm ... the reason why our business is blooming even though we are not doing much promotion? Maybe it is because we have been opening at the flea market in Bundang, Baekhyun-dong café street every two weeks for two years. Customers who buy our products at the flea market, promote our products naturally through world-of-mouth. We want to say ‘Thank you’ to all our customers! 7. Lastly, what do you think about jam? We think the ‘fragrance’ and original taste of fruit are important in jam. In fact, Korean people stress the sweet taste of fruit by putting ‘honey’ in front of the names of fruit. Unlike them, we think the sweet taste of jam is important but fragrance is also very important, too. The original taste of fruit is crucial too. For that reason, we try to use fresh ingredients. For example, whenever we make grapefruit marmalade jam, we use fresh grapefruit. Plus, we insist on using organic fruit. During the interview, I was so full from the German Malte couple’s warm smile. I guess customers who taste their jam and buy can recognize the Malte couple’s warm smile. The Malte couple are the sellers who do not sell their jam through online even though they can get much more profit from less cost. This is because the couple cannot communicate well with customers through online sales. You can trust them and go to their offline market which is going to be opening soon. I recommend you say hi to this couple if you see them at the flea market. They will greet you like you are their best friends and make you feel full with their bright smile.